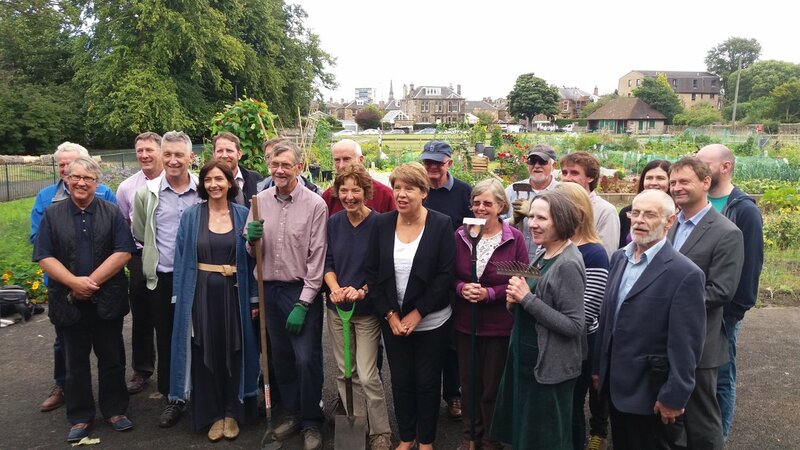 Edinburgh’s newest allotments have been officially opened on the site of a former bowling green in Leith. 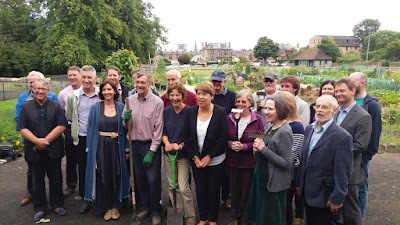 Transport and Environment Convener, Councillor Lesley Hinds, was joined by members of theFederation of Edinburgh and District Allotments and Garden Associations(external link) (FEDEGA),Scottish Allotments and Gardens Society(external link) (SAGS), community councils and plot holders to mark the event at Victoria Park on Wednesday (31 August). The area was transformed earlier this year after a local consultation found that some form of community garden would be welcomed on the site of one of the bowling greens, which was deemed as under-used. There are now 16 ‘mini’ allotments on site, along with a toilet and communal storage unit, plus a community plot for use by pupils of the neighbouring Trinity Academy, encouraging education in food growing, biodiversity and nature. Environment Convener, Councillor Lesley Hinds, said: “We have worked closely with the local community to ensure the redevelopment of this site benefits as many people as possible. “I am delighted to see the allotment plots are already well used, and that the garden is helping to teach local young people more about sustainable food growing and nature. In 2014 it was proposed to redevelop a number of Council-managed bowling greens due to a significant drop in users over previous years. Other bowling greens have since been turned into tennis and petanque courts, growing areas and in one case a school playing field. Victoria Park allotments, which came into use earlier this year, have been designed to be easily accessible for people of all abilities, and were offered to both local residents and those on the Council’s allotment waiting list. The facility cost £50k to develop, funded by the Council’s Parks and Greenspace Department, and has been created to be in-keeping with the surrounding environment. Find out more about Council allotments. Congratulations to all those pupils who were successful in their exams this year. Once again, the city achieved record results - testament to the commitment of our teaching staff and hard work put in by pupils that results have yet again exceeded expectations. A total of 39,884 results were awarded for 8,007 candidates in more than 80 subjects, ranging from Accounting to Urdu. Of particular strength is the success of pupils by the end of S5 and S6, where strong levels of attainment have either been maintained or improved at all stages. I wish every success to those young people who are embarking on the next stage of life's journey whether that is at university, college or in work. Well done to you all! I'm delighted that all schools affected by recent closures have now reopened in time for the start of the new term. It has undoubtedly been a very difficult few months for everyone affected by the closures and thanks must go to parents, staff and pupils for their understanding and patience. The revised exam arrangements, in particular, worked well and (as above) all five affected high schools saw improvements in their results - in common with other schools unaffected by the closures. We pressed the Edinburgh Schools Partnership to ensure the schools opened on schedule so I'm pleased we have achieved this. All the relevant safety paperwork has been published on our website having been reviewed by an independent expert on behalf of the Council. Now we must establish what went wrong when these schools were built. The independent inquiry, being led by respected construction and procurement industry expert John Cole, has already started and my intention is for it to be completed by the end of the year with a full report coming back for councillors to consider. On 31 July, the Capital became Scotland's first 20mph city, with the lower speed limit coming into effect in the first phase - Zone 1 - of a citywide rollout. Streets across rural west Edinburgh and the city centre are now 20mph, with key arterial routes in the zone retained at 30 or 40mph. Edinburgh is following several European and UK cities in bringing traffic speeds down. Slower speeds encourage better sharing of road space, encourage active travel, make us feel happier spending time in an area and - most importantly of all - they greatly reduce the risk of being fatally injured if hit by a vehicle. While around half of our city was already 20mph, as a driver and cyclist myself, I know it'll undoubtedly take time before it becomes second nature for people to go more slowly in the new zones. A map of the 20mph network and implementation timetable is available on our website. The percentage of the Edinburgh workforce with a degree level qualification or equivalent is higher than any other major UK city and has risen again, to 55%. This has gone up from 46% in 2013. This is one of the many facts about the city in our latest Edinburgh by Numbers, published at the end of last month. Edinburgh also continues to be the most prosperous city outside London and has created more jobs through foreign direct investment than any other major UK city outside London. The document also highlights that more waste was recycled in Edinburgh from April 2013 to March 2015 than any other major Scottish city and that almost two-thirds (65%) of people in Edinburgh use the internet on the move. Here we are almost 70 years on from the first Edinburgh Festival and, once again, thousands of performers, directors, artists and producers are in residence making some of the best creative work in the world. And, if the early signs are to be believed, August 2016 is set to be one of the most inventive and successful yet. The tourism benefits are, of course, huge. We know the festivals position the city as a leading international destination but this year's Impact Study proves 94% of people believe the festivals make Edinburgh a special city. Re-affirming our position as the World's Festival City, the research also proves festival events support the equivalent of 5,660 full time jobs and generate a massive economic impact of £280m locally and £313m in Scotland. A truly exceptional performance. This month we were proud to receive 'Carer Positive-Engaged' status, something which recognises the work we do here at the Council to support those who provide unpaid care to an ill, frail or disabled family member, friend or partner. With people working later in life and our population getting older, it's inevitable that more of our employees will become carers at some point. Those who provide unpaid care play such an important role in society and, indeed, the lives of the people they care for, so it is essential that we recognise their needs. By working closely with employees to ensure a flexible atmosphere, the necessary leave and to provide information and support where needed, I am certain that we will create a comfortable and productive workplace for everyone. 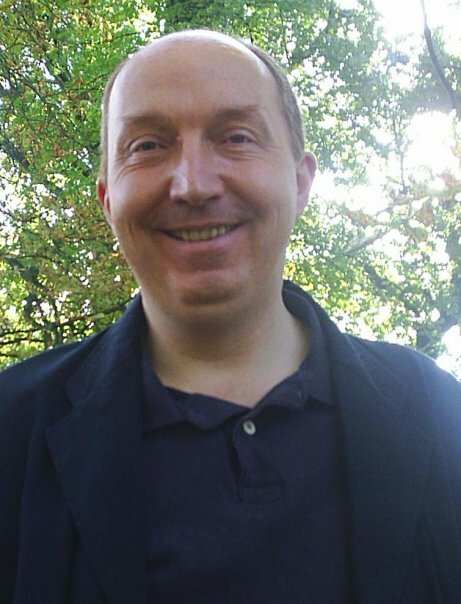 My fellow councillor, Mark McInnes, was appointed to the House of Lords in the outgoing Prime Minister's Dissolution Honours List. While I tend to take the old-fashioned, democratic view that the Second Chamber of the United Kingdom should be elected by the people and am not a fan of the discretionary honours system, on a personal level, I do want to pass on my congratulations to Mark on being awarded the peerage. I've been on the Council at the same time as Mark for over a decade and I've no doubt that he'll take an effective approach to robustly scrutinising legislation in the House of Lords. Finally, readers may well already be aware that I confirmed this week I don't intend to stand for potential re-election next May. I have published a personal blog-post explaining my decision. I simply want to focus on other (non-political) interests in the next few years of my life. Nothing more, nothing less. It's an entirely personal decision. Of course, I will continue to fulfil the duties in my role as Council Leader - to the best of my ability - right through until next May. Back in 2012 I committed to a five-year term, and I intend to complete that term and finish the work that both myself, and the current Coalition, have a mandate to deliver upon. Welcome to Edinburgh, one of the world's friendliest cities! CouncilLeader Andrew Burns has welcomed news that the Capital is the only UK City to make it on to a shortlist of the world's friendliest cities.
" A “great mix of ancient and modern” with “great energy” - be it on a typical Tuesday or during the Edinburgh Fringe Festival. 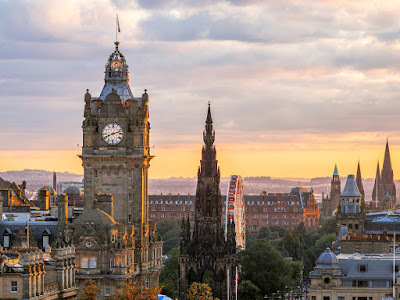 One reader in particular shared this lovely story that seemed to sum up Scotland's capital city: “Just down the Royal Mile from the [Edinburgh] Castle we happened on a little restaurant with eclectic/offbeat décor, interesting food, and presentation. After luncheon, when we left, my husband was jostled and fell - several people stopped to help, were very concerned about his well-being. They even offered to drive us back to our accommodation - what great people!” "
I can't quite believe it --- but today marks 10-years of the "Really Bad Blog"! There is just no doubt that tourism more widely, and the Edinburgh Festivals in particular, are of huge importance to the Capital City, and to Scotland as a whole. And, as Edinburgh is about to fully enter the 2016 Festivals-season, it’s worth reflecting on the huge, overall value (in every sense of the word) that this time of year provides to our home City. As the current Council Leader in Edinburgh, I do understand the importance to our local economy of tourism, and specifically of the Edinburgh festivals – I know that Scotland’s capital city is one of the most desirable tourist destinations in Europe, welcoming an astounding 4-million individual visitors a year … that’s 8 times the current resident-population of the whole City. And Edinburgh also acts as the gateway to Scotland, with around 60% of visitors spending time in the Capital before seeing other parts of the country. The world-class cultural offer in Edinburgh is also a vital stimulus for the wider City Region’s significant creative and service industries. Edinburgh’s cultural offer now centres on its 12 major festivals, which have unrivalled international appeal, and the year-round cultural infrastructure (providers and venues) which enable the festivals to thrive. Indeed, just this week research has been published which confirms the huge contribution that Edinburgh’s Festivals make to the quality of life, international reputation and economic vitality of Edinburgh and Scotland. This latest ‘Impact Study’, which surveyed 29,000 people during 2015, shows that Edinburgh’s Festivals continue to be Scotland’s world-leading cultural brand, delivering significant attendance numbers through their unrivalled cultural programmes. Key findings from the study show that Edinburgh’s Festivals are now attracting specific audiences of over 4.5-million, which puts them on a par with the Football World Cup, and being second only to the Olympic Games. That’s right – last year, Edinburgh’s Festivals were the same size (in audience terms) as the Football World Cup; and there’s no reason to believe that this year we will see a similar, if not larger, audience attendance right here in Edinburgh. And most crucially, this level of activity acts as a significant economic driver for Edinburgh and Scotland. Last year’s impact study showed that the Festivals generated some £280million for the local economy; and a further £313million was generated for the wider Scottish economy. That economic activity provides a very real benefit to literally thousands of families here in Edinburgh – now supporting the equivalent of 5,660 full time jobs … with a further 6,021 full time jobs being supported Scotland-wide: all directly due to the Festivals. The impact study also looked in detail at visitor’s impressions of Edinburgh as a result of their Festivals’ experience – key findings from this section of the study show that some 94% of respondents believe that the Festivals are part of what makes Edinburgh special as a city. It’s also very clear that the Festivals create a sense of ‘civic pride’ with 89% of audience members agreeing that the Festivals increased their pride in Edinburgh as a city. Amidst these visitor statistics, it really is crucial to remember that the Festivals also attract a huge number of Edinburgh residents as audience members. 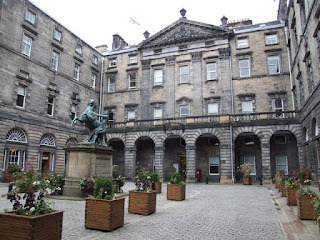 For nine years now the Council – via an independent market research company - has undertaken a wide-ranging Edinburgh People Survey (EPS) to gauge the feelings of residents by asking quality of life issues. Last year’s 2015 Edinburgh People Survey found that some 63% of residents had participated in the Festivals, which were the most common cultural activity for local citizens, while also showing that those participating in cultural activities were more likely to have a positive view of the Capital City. All of this is obviously positive news as we approach 2017, and the 70th anniversary of the birth of Edinburgh as a Festival-City. This 2015 ‘Impact Study’ (echoed by the findings of the 2015 Edinburgh People Survey) really do underline the very real value that our Festivals provide to our City; and remind us that our distinctive cultural offering remains the absolute envy of other cities around the world. All 17 closed schools have reopened ahead of schedule with the final two handed back to the City of Edinburgh Council today (Thursday 11 August). Remedial works on Drummond Community High and The Royal High have been completed by the Edinburgh Schools Partnership which means all pupils will be back in their own schools as normal for the start of the new session next Wednesday (17 August). In total 17 schools were closed with 7,600 pupils affected as the Council put in place a huge logistical plan to provide alternative arrangements. More than 5,000 children were educated at over 70 different schools and education facilities during the three months up to the start of the summer holidays. Council Leader Andrew Burns said: “I’m delighted that all of our pupils affected by the closures will be back in their own schools next week as we promised parents we would try to achieve this. We stressed to the Edinburgh Schools Partnership that they should bring forward school reopening dates where possible which has happened. “Our priority has always been the safety of our pupils and staff and we insisted that ESP and their contractors ensure all our schools are 100% safe to reopen. All the relevant paperwork has been published on our website having been reviewed by an independent expert on behalf of the Council. “I want again to thank parents and pupils for their patience and understanding and teaching staff for their commitment and flexibility during these difficult past few months. “The next steps now are to establish exactly what went wrong with these schools. The Council has appointed respected construction and procurement industry expert John Cole CBE to lead an independent inquiry. Correspondence from ESP and their contractors providing safety assurances has been regularly published on the Council website(external link) as each school reopened. The independent inquiry has already started and is expected to finish before the end of the year. The nervous wait is finally over today (Tuesday 9 August) as thousands of pupils across Edinburgh receive their exam results. Candidates in Scotland's Capital have once again exceeded expectations from previous years and there have been notable improvements in several key measures. A total of 39,884 resulted awards were certificated for 8,007 candidates in more than 80 subjects, ranging from Accounting to Urdu. A particular strength is the attainment of pupils by the end of S5 and S6 where strong levels of attainment have either been maintained or improved at all stages. By the end of S4, 43% of the S4 roll achieved 5 qualifications at National 5 level which is an increase of 4 percentage points from last year. By the end of S5, 37% of the S4 roll achieved 3 or more Highers – a 2 percentage point improvement on last year and an 8 percentage point improvement since 2011. By the end of S6, 66% of the S4 roll achieved one or more Highers – a 3 percentage point increase on last year and an 11 percentage point improvement since 2011. By the end of S6, 25% of the S4 roll achieved one or more Advanced Highers – a 3 percentage point increase on last year. Twins Thomas and Adam Anderson, 16 years, both sat 5 Highers at Liberton High School this summer. Councillor Paul Godzik, Education Convener for the City of Edinburgh Council, welcomed today’s results. He said: “SQA exam results show that 2016 has been another really positive year for our pupils, with performance rising yet again. It’s a real achievement to have not only sustained but built on the successes from previous years. “This year’s results are very encouraging with a year on year improvement since 2011, resulting in our best ever results and by the end of S6 an impressive 66% achieved one or more Highers - a 11 percentage point improvement since 2011. "I want to congratulate all those who sat exams this year, and thanks must also go to all our staff who have been working extremely hard. Our pupils should be very proud of themselves too – all their hard work has certainly paid off and praise should also go to parents who have supported their children over the past year. “Another key aim is to make sure all school leavers enter a positive destination of employment, training or further education. Initiatives such as the Edinburgh Guarantee are going a long way to making this a reality for many of our former pupils. All candidates will receive their results by means of the traditional postal delivery on Tuesday 9 August. Those candidates who have activated their MySQA accounts, through which they can choose to receive their exam results by text in addition to their results certificate, will also receive these by 9am on Tuesday 9 August. 5+ awards at level 5 or better – 43% (4 percentage points more than last year). 1+ award at level 6 or better - 59% (1 percentage point more than the previous year; continues a five year improving trend and a 9 percentage point improvement since 2011). 3+ awards at level 6 or better - 37% (2 percentage points more than the previous year; continues a five year improving trend and an 8 percentage point improvement since 2011). 5+ awards at level 6 or better - 18% (1 percentage point more than the previous year, an improvement of 4 percentage points since 2011). 1+ award at level 6 or better - 66% (3 percentage points more than the previous year and an 11 percentage point improvement since 2011). 3+ awards at level 6 or better - 46% (2 percentage points more than the previous year, a continuing improving trend and a 6 percentage point improvement since 2011). 5+ awards at level 6 or better - 32% (maintaining last year’s good result and a 4 percentage point improvement since 2011). 1+ award at level 7 - 25% (3 percentage points more than last year and an improvement of 5 percentage points since 2011).